Check out the member profiles on the navigation bar above! 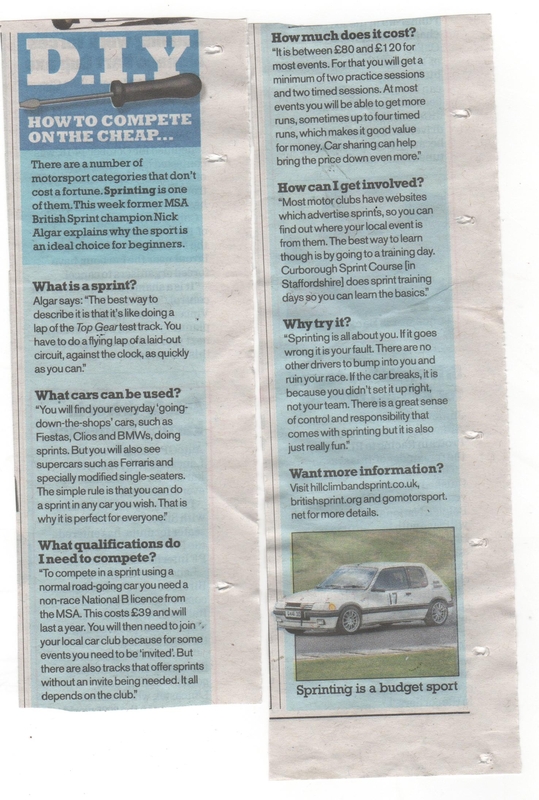 A useful and pertinent news cutting from this week’s edition of Motor Sport News. 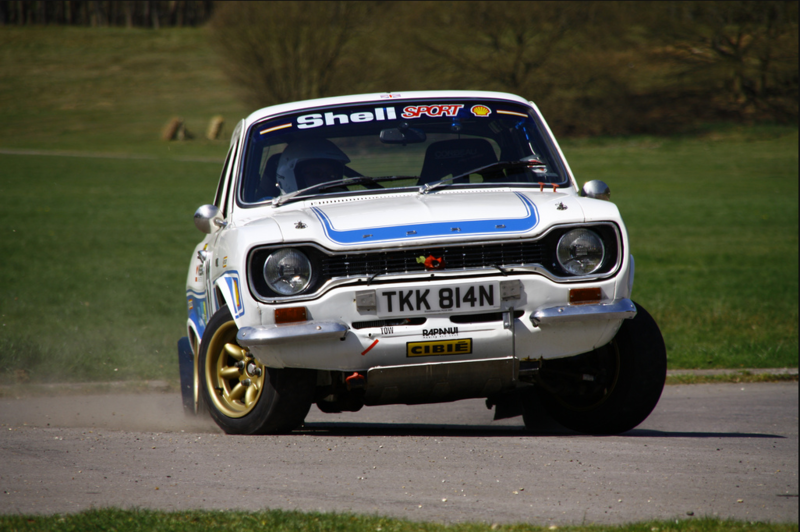 The FDMC and Sutton and Cheam car clubs are hosting the Odiham Sprint held at RAF Odiham. It is a 1.9 mile circuit with no cones as it is a natural road circuit. 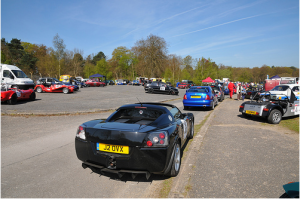 Like the previous Dimanche Sprint held earlier this year at Rushmoor Arena, the format and costs are similar and nearly any car is suitable – they’ll find you a class! As a member of the ACSMC, IOWCC members are able to compete without joining either FDMC or Sutton and Cheam, you merely have to present your IOWCC membership card at sign on. A rusty old rally car managed 5th overall at the Dimanche, so it is possible to competitive in both class and overall. After rave reviews of the Dimanche, you’d be mad to miss this and what is more that course is nearly double the length of Rushmoor. This car will be there so get your entries in! Still to get quotes for beams and look at old beams to test functionality. Pauls house 10am this coming Saturday. Calbourne PCT and Autotest all fine, run as a social event. Club to fund. BB rules start @ 14:30 Saturday. 10:00 Sunday. Very relaxed. RT and RW to present these completed before or at the next meeting. PR to provide them with electronic versions of historical versions. MS to speak to MSA regarding liability of club / individual administering first aid. Should it look ok then the club to fund RF, RW and AW 1st aid course @ £85 each. Should be addressed to clerk of the course on the day. Then, if needed, elevated to the steward. This to be added onto drivers briefing and website. Further complaints to be sent in writing to committee with £10 complaint fee. HW, need to get details out to membership in order to get hotel booked and obtain exclusive use. With a cancelled fourth round due to farmer based weather constraints the next event was eagerly anticipated and 17th July duly obliged with one of the calendars favourites, BAE systems, Cowes. Weather was again looking to play havoc with this event, rain, sunshine and heavy wind were all forecast. A very heavy downpour whilst setting up the equipment gave the first indication of what was to come. Track conditions were ever changing from grippy to very very slippery. With an excellent attendance of over 45 drivers the day was set. The course was fairly flowing but quite large, a sub minute time was going to be the order of the day for top of the leaderboard action. Steve Stotesbury the very man who laid out the course and also did a demonstration run was the first to put a time on the board, unfortunately for him though he recorded a wrong test almost immediately after he left the start box. Marion Saunders driving a classic Mini was the first to record a meaningful time of 1:19.86 but Andy Williams soon showed us where we needed to be laying down a 58.47 easily breaking the sub minute barrier. The Dutch brothers were proving to be quick again in their Minis but the largest threat looked to be coming from Dave Goodwin and Dan Morgan, as ever! Class 1 was as ever taken by Jemma Western, a class Jemma has now made her own! With only one car to compete a time of 1:10.18 took class honours. Class 2 at least had two drivers to battle it out, Dean Long as ever driving a Mk1 Mx5 and Luke Kozakewycz in a Toyota Supra. Dean was enjoying his tail happy Mx and the slippery conditions as he drifted his car beautifully between cones. Eventually recording a time of 59.59 three seconds faster than Luke. Where are all the competitors in standard cars? Come along people, bring your car and have some fun! Class 3 was once again the class of the Mini, this class could almost be renamed. With 11 competitors and 9 of them driving classic Minis chances are that a Mini would take the class win. Both Dave and John Dutch looked quick in a saloon and a pickup recording times of 55.71 and 59.34 but at the head of the pack Dave Goodwin was dancing his car around to not only take class honours but the overall win as well, an incredibly consistent day for Dave considering the inclement conditions. Recording a final all conquering time of 53.72 and a run spare at the end of the day as well! Well done Dave the Sealed surface championship is now yours to lose. Class 4, once again the most hotly contended with most competitors driving cars in this division. Twenty three cars in total! Dave Bizzill driving a Subaru Impreza was the first to record a memorable time with a very respectable 58.60, perhaps Dave had brought the correct equipment for this soggy Sunday. Steve Glasbey was looking very tidy all day driving a TVR and propelling himself to a final 9th place with a 56.97, the Rover V8 engine sounding beautiful as it went about its business. 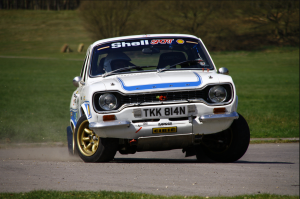 Richard Weaver and Neil Glasbey made valiant efforts to win the class but ultimately it was Andrew Leppard and Toby Allen battling for the honour. Toby had set an early time of 55.71 to keep everyone on their toes to which Andrew replied with a 55.48, alas Toby was not to lay down and foiled the rest of the class with an astonishing 54.88 to sweep up not only class honours but was also good enough for second position overall. An amazing feat in such changeable conditions. Class 5, the special class! Andy Williams as ever set an early time of 55.96 and could probably have improved had his second driver Russell Thomson not broken the car whilst doing his third run. With a broken car Andy could not improve leaving the door open for Dan Morgan. Dan was fast from the outset but unfortunately was struggling to get a clean round, taking out cones on his runs. With rain distracting him Dan eventually pulled a 55.49 out of the bag to take the class and 4th overall. Another excellent IOW car club event, Dave Goodwin taking the accolade for what was a very consistent well driven performance. Driver of the day for me was Toby Allen defying logic in his Mx5. This event kicks off at the usual time of 10am sharp, but you need to sign on from 9am-9.30am. The safety briefing and track walk will be held at 9.35am before the first car is let loose. You can sign-on in advance from the clubs website linked here http://iowcc.co.uk/payments/ and pay via paypal which will help the smooth running of the event on the day. 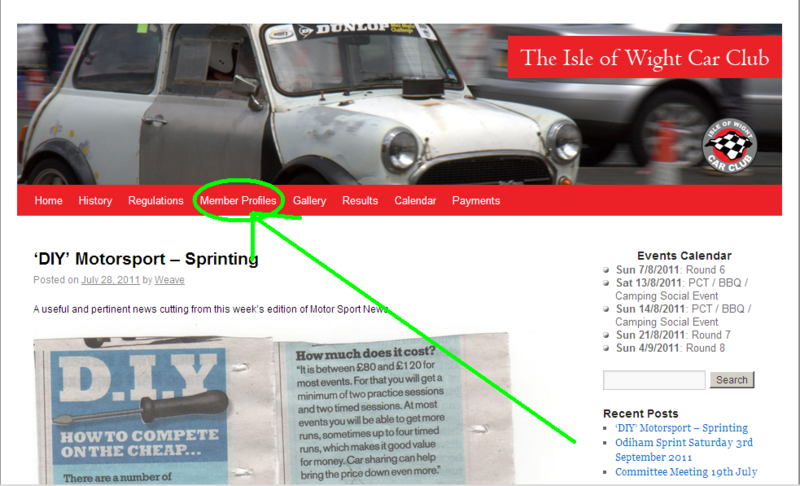 I strongly advise most members if possible to sign-on in advance as this really helps makes the event to run on time. Just to make you all aware again, DAY MEMBERS and NEW FULL MEMBERS wanting to sign up this Sunday, must show their driving License as part of sign-on admission. Failure to do so will result in declined membership. On no account must engines be revved prior to 10am and after that time any revving other during runs must be kept to a minimum. Cars must not be started prior to 10am unless absolutely necessary and must be kept running for the minimum time possible. Driving of cars to and from the venue must be undertaken in a sensible ‘quiet’ manner at the approach to the venue. These restrictions are necessary owing to concerns previously expressed by residents near the venue. any breach could jeopardise the club’s continued use of the venue and the transgressors will be dealt with severely by the club with potential sanctions including exclusion from the event. The committee would appreciate if all could take note and adhere to this request. Based on complaints and to try and assist with numbers available for marshalling, the committee propose changing how events are run. All competitors willnow have to complete 3 runs before any competitor can attempt a 4th. Any competitors unable to complete 3 runs by the mid point of the day will have their runs forfeited however they may be able to continue from their 4th run after the mid point. There is also a change with late competitors signing on and taking part. Normally if a member gave notice of late attendance to Membership, they would have a briefing and walk round at the mid-point on the day. This meant they would have 6 runs. Now due to the new rule change, members arriving late are still able to compete later in the day (with a valid reason and notice given) but will only have 3 runs. Hopefully see you all on Sunday. SS still to arrange trailer design / printing. Look into rules regarding WT and amount of tests completed to gain points at events. Possible rule change depending outcome for next season. Based on complaints and to try and assist with numbers available for marshalling AW and RW propose changing how events are run. All competitors will have to complete 3 runs before any competitor can attempt a 4th. Any competitors unable to complete 3 runs by the mid point of the day will have their runs forfeited however they may be able to continue from their 4th run after the mid point. All agree, SS does not agree. Agree to improve how we let each other know about event attendance. If a committee member is not going to attend an event they must have mailed the committee by the Friday before the event. Postponed round 4 from Atherfield to be run on 25th September. Venue TBC. AW points out we need to stick to committee decided rules at all times. They cannot be changed on the fly. Clark of the course should report to committee after the event bringing up any issues. PW / SS / AN Other to attend the FDMC summer Solo to see how events are run with a view to improving our own club. Club to pay ferry fare.Meeting closes @ 10:00.